Exclusively offered by orchids.com, these beautiful photographs of orchids shot by Eric Fang will delight all who receive them with a note from you. 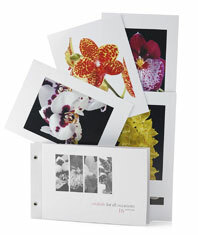 16 different image postcards are cleverly bound together that can be tear off individually. Postcards dimension @ 5 3/4" x 4"